Inspector Hound provides an accurate, UNBIASED bed bug inspection. Inspector Hound is independent; this means we have no ‘deals’ and get no kick-backs from pest control companies. When you get a quote from an inspection agency, make certain they’re independent. Scent detection dogs have been used for decades to find explosives, missing persons, narcotics, cancer and more. Now they are considered cutting edge technology in pest control, and in our case, finding bed bugs. Bed Bug Beagles are scent hounds, developed for tracking. They have a keen sense of smell and tracking instinct that makes them ideal for locating bedbugs. Our handlers and K9 were trained at J&K Canine Academy. 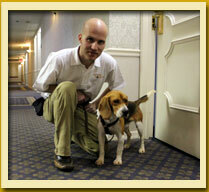 Our K9 is not cross-trained; our dog is ONLY trained to find LIVE bed bugs & their eggs. This means higher accuracy. Faster: While it is easy to find large infestations quickly, small or just beginning infestations are tricky and require a bed bug dog. Visual inspections by humans require the entire area to be torn apart - taking lots of time. Bed Bug dogs have minimal requirements and begin work immediately using scent. Confidential - We NEVER discuss business with guests, clients or potential clients. When a problem is found, we recommend the customer contact a pest control professional for treatment options. We are located in the Louisiana area but our skilled Handlers and Dogs work throughout Louisiana, Mississippi, Arkansas, and Texas for bedbug inspections. We know where and how to find bed bugs. Our bed bug dogs pinpoint, locate, identify, detect, find bed bug infestations through scent detection. Our trained canines are simply the best at finding bed bugs.